EVERY YEAR – PEOPLE DISAPPEAR! 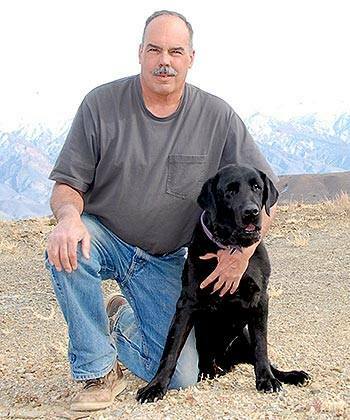 Former Police Detective Paul Dostie with his famous grave detection dog BUSTER. Forensic Recovery Services (FRS) is an organization dedicated to advancing science in the detection of clandestine graves. And, integrating science with more conventional means of finding buried human-beings, such as grave-detection dogs and ground penetrating radar. The missing person could be a serviceman or woman whose body was lost in the fog of war and cannot be accounted for. Or, the missing person could be a college coed who was raped and murdered in a dorm room, then tossed in some makeshift-grave miles from campus. Some are found, and sadly, because of various reasons, some are seldom found. We have found that politics, more than science appears to be the reason why people are not found. In the quaint little town of San Luis Obispo, California that scenario is playing out right now. Law Enforcement officials are either bumbling, inept, stupid or just plain corrupt. College freshman Kristin Smart suddenly disappeared from the campus of Cal Poly San Luis Obispo in 1996. The last person seen with Kristin alive pleaded the 5th Amendment 27 times. He admitted to his roommate that he killed Kristin and that she was at his mom’s house. BUSTER alerted four times near the rear left corner of his mother’s home, and Dr. Vass brought in his Inquisitor machine to detect human remains which it did. Not even knowing where the suspect home was located his machine triangulated to an area where BUSTER alerted four years prior. What did the sheriff do… absolutely nothing. And, the saga continues. We offer highly trained grave detection dogs to assist in the search of clandestine graves, that are trained by the world’s best trainers to zero in on the scent of human remains. We also provide the very best Ground Penetrating Radar (GPR) experts to search for anomalies hidden beneath the soil or concrete. We provide clinical analysis of soil samples which could lead searchers to the location of a human body. We are developers of novel instrument technology for remote, non-intrusive, at-a-distance detection and location of people, substances, materials, and objects to assist in locating items of interest to law enforcement professionals and forensic investigators. We also offer our services to various organizations beyond law enforcement such as national security agencies, private individuals or companies. Upon engagement, one or more highly skilled professionals will be scheduled and dispatched to your site to employ technology to assist in locating the object or person of interest. Forensic Recovery Services acts as a support organization for law enforcement. When their efforts turn up no results, we have the tools and team of experts to take the search to the next level. While we hope to receive the full support of law enforcement in our efforts to help find a missing person, we can and do operate independently without any assistance from law enforcement. As a matter of policy, and as a bare minimum, we generally do not become involved in search efforts unless we have the full support of the next of kin. If the next of kin are being told not to confide in us and trust our abilities to find clandestine graves, there’s not much we can do. Sometimes, law enforcement is fearful they will be upstaged, and not only refuse cooperation, but also poison minds against or organization. It’s ridiculous, but these things sometimes happen. The search is always made more difficult when testosterone and politics interfere. Many of the scientific tools we use are secret in nature and are patented processes or implements. There is no other organization in the world who can do what we do. We operate independently and secretly to help find the victims of crime or those who have fallen in battle. Finding clandestine graves is a tedious and complex business which does not always result in a guaranteed find. We do believe that FRS is the very best organization in the entire world for finding hidden grave sites. We have tools no one else has and the experts that are the best in their field of expertise. Even with all of the people and tools at our disposal, we cannot and do not guarantee a positive outcome or success for every search. While we have great confidence in our technology, certain factors have been shown to impact instrument response. Examples include potential interference from high-voltage sources; certain search area size and topographic features; and human attempts to conceal, alter, and/or adulterate the object of the search. 3) rapid turn-around research projects which will assist in answering/solving scientific/forensic questions or puzzles. The number of missing persons in the US is reported as 18,000 homicides and 100,000 missing persons reported annually in the United States (Ref: Bureau of Justice Statistics; National Center for Health Statistics; National Center for Missing Persons). As many as twenty-five percent of homicide cases are discontinued and designated cold cases because there are no leads or relevant evidence to pursue them further. While law enforcement entities would like to solve each and every crime, the harsh reality is they just don’t have the people power to do it, nor to many departments have the required specialized training to find clandestine graves. Digging a hole is easy. Locating clandestine graves is extremely difficult, especially if several years or decades old, yet crucial to the adjudication of a criminal who disposed of their victim in this fashion. Memories fade, the environment changes, and even when the suspect is brought to the scene, in many cases the victim is never found or is later found nowhere close to where initially indicated. Techniques or methods used to find clandestine graves have been, in many cases, unreliable, conflicting or, in some cases, are only suitable for small search areas. Random digging is physically demanding, expensive, time-consuming, and requires significant manpower resources which, for LE, is better served to assist the living. There is no ONE technology that can be used for every scenario since each death scene is unique and poses its unique challenges, whether man-made or environmental. Technology which can be applied to locating human remains (whether buried or on the surface) changes based on soil type, terrain, size of the search area, the manner of death, the age of scene, moisture, flora, fauna, etc. In order to be most effective in locating human remains, you must have an intimate knowledge of the decompositional process (what we break down into and where do these products go). We combine a multitude of technologies with a team of experienced, dedicated individuals who have a strong background in various scientific fields. These disciplines include; biology, microbiology, chemistry, physics, geology, botany, in addition to instrumentation, mapping techniques, research design, and implementation, etc. Even with all of this, success is NOT guaranteed, but the likelihood of finding missing grave sites has never been better with a multi-disciplined, full-court-press. Genetic-based (part of major histocompatibility complex – MHC, which cannot be changed) – microbial flora can be part of this. Odors created from chemicals like perfumes/deodorants. Analysis of odor at a scene can be accomplished by sniffing devices such as LABRADOR machine – (light-weight analyzer for buried remains and decomposition odor recognition) or collection of air samples and subsequent analysis with a gas chromatography/mass spectrometer. This type of analysis is currently NOT performed by crime laboratories. Bone produces an electric field when pressure is applied – for example, soil pressing on the bone when buried). This can be detected using various instruments and can be detected as much as a mile away. Amazingly, Dr. Vass using his Inquisitor machine has detected skeletal remains up the 30 miles away. During decomposition, soft tissue and bone break down into their chemical building blocks. These products soak into the matrix upon which the body resides (soil, clothing, etc.) and can be detected using chemical assays and various instrumentation. Some of these products are human specific and can differentiate human from animal remains. The microbiology surrounding a decompositional event changes since many nutrients are released into the soil during decomposition. Culturing the microbial flora in the soil or performing PCR analysis can assist in confirming a clandestine grave location. A variety of instruments which can assist in confirming disturbed soil or subsurface anomalies. These are useful in confirming the location of potential clandestine graves. A highly trained grave detection dog is the gold standard. Usually, the first technology to be deployed due to the unmatched sensitivity of the canine olfactory detection system. Must be used in conjunction with additional confirmatory technologies. Bone/tissue produces a unique resonant frequency which can be detected and utilized in narrowing down the search area for human remains. In some situations, nutrients released from the decompositional process will allow for the growth and proliferation of unusual or unique flora. This should be used in conjunction with soil chemistry to assist in pinpointing the search area. The scientists, searchers and staff members of Forensic Recovery Services are dedicated to helping find the loved ones of people who suffer due to lack of closure. We use science to the nth degree in combination with tried and true methods such as a good grave detection dog. We work as a team to solve the crime and bring closure. It’s what we do.